We've heard your first impressions, but now some of the official iPhone 4 reviews are in. And so far they sound good. Here are the highlights of what the early reviewers are saying. "The first thing you notice is the new shape. Despite a beefier battery (16 percent more likely to last a full day), a faster processor and upgraded everything, the new model is still noticeably thinner and narrower than before. How is that possible? In part, the trick was squaring off the back. It's no longer gracefully curved - a design that, if you think about it, created wasted space around the rectangular components. The new iPhone is two glass slabs, front and back, wrapped by a stainless-steel band. The result is beautiful, and since there's no more plastic, it feels solid and Lexus-like. But it no longer feels like a soothing worry stone, and it's now impossible to tell by touch which way it's facing in your pocket. The new metal mute and volume buttons are much stiffer. Still, Apple says the iPhone 4 is the world's thinnest smartphone, and most people will approve of the trade-offs." 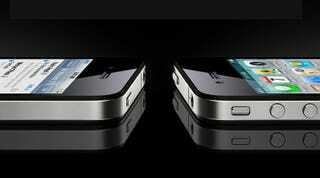 "It's not just the face of the phone that's undergone a transformation — the iPhone 4 is all new inside as well. For starters, Apple has moved on from the Samsung-built ARM Cortex-A8-based CPU used in the 3GS to its custom A4 chip used in the iPad, which funnily enough... is an ARM Cortex-A8-based CPU. While the company hasn't yet said what the clock speed of the processor is, we're guessing it's something below the 1GHz touted for its tablet cousin. The phone is definitely snappier than the 3GS, so we're not about to volley complaints just yet — in particular, graphics seemed to render faster, and overall responsiveness was slightly higher, though admittedly, it wasn't blowing the doors off the joint. It's certainly faster, but the 3GS wasn't hurting on speed to our eyes, so it's not as wildly noticeable a leap as the 3G to the 3GS." "I've never been wild about the camera on the early iPhones, but the main camera on the new iPhone has come far. The iPhone 4 sports a 5-megapixel autofocus camera with a 5x digital zoom and - first for an iPhone - an LED flash. I took several decent pictures in low light but had some grainy results, too. It's not a great camera for capturing fast-moving action. Close-ups taken with the 5x digital zoom, which is an iOS 4 addition, were so-so." "Battery life has been an Achilles' heel with earlier versions of this device. It's noticeably improved, and that's a good thing, because much of what this device can do will require more power, over more time. You're gonna want more battery. With light use, but with 3G data and WiFi turned on the whole time, I got a full 4 days of battery life. With very heavy video recording and playback, instant messaging, email and data tethering over 3G, I got a full day of battery life. I didn't have enough time before this review to do careful benchmark testing against Apple's claims, so I can't provide specific percentages, but it felt like the battery life was a good 20-25% meatier." "Apple has a unique talent for making us want something we never knew we wanted. The iPhone 4 features a 940x640-pixel (or 300 326 pixels per square inch) "Retina Display," which is four times the resolution of previous iPhone models. What's more, it uses the same IPS display that's found on the iPad with an 800:1 contrast ratio. Though we've always thought highly of the current iPhone displays, Apple rarely rests on its laurels. Also, the company needs to compete with the gorgeous AMOLED screens and TFT displays we've seen on many Android phones like the HTC Evo 4G. In our brief hands-on, the display is clearer than crystal clear (Brian Tong's words). Since it renders all text the same, we had no problems reading a variety of Web pages. Photos looked especially lovely, particularly when you compare the same image between an iPhone 4G and an iPhone 3GS. We're not inclined to believe all of Apple's claims about the display's capabilities, but there's no denying that it looks good." "Both Apple and AT&T told me they worked to make the iPhone 4 do a better job with AT&T's network. For example, the phone itself is surrounded by a prominent stainless-steel trim piece that acts as a large antenna. And Apple said it also tuned the phone to try to grab whatever band on the network was less congested or less affected by interference-to stress the quality of a signal over its raw strength. AT&T said it, too, made some changes to its network with the new iPhone in mind. However, on at least six occasions during my tests, the new iPhone was either reporting "no service" or searching for a network while the old one, held in my other hand, was showing at least a couple of bars. Neither Apple nor AT&T could explain this. The iPhone 4 quickly recovered in these situations, showing service after a few seconds, but it was still troubling."